In Week 3 we are running the following FREE workshops. Please follow the links below to book your place. Go to https://libguides.bodleian.ox.ac.uk/workshops/workshopsbydate for a full list of upcoming iSkills workshops. Who is this session for? Undergrad and Postgrad students, Researchers and anyone interested in this topic. This workshop will provide a grounding in the different ways quantitative and qualitative data is being made available to benefit researchers; and aims to provide an overview of macro and micro data sources available at the University of Oxford, including national data archives, subscription services and business data, and some pointers for further searching. From Monday 16th April we revert to term time hours: Monday-Friday 9am-7pm, Saturday 10am-4pm, Sunday 11am-5pm. 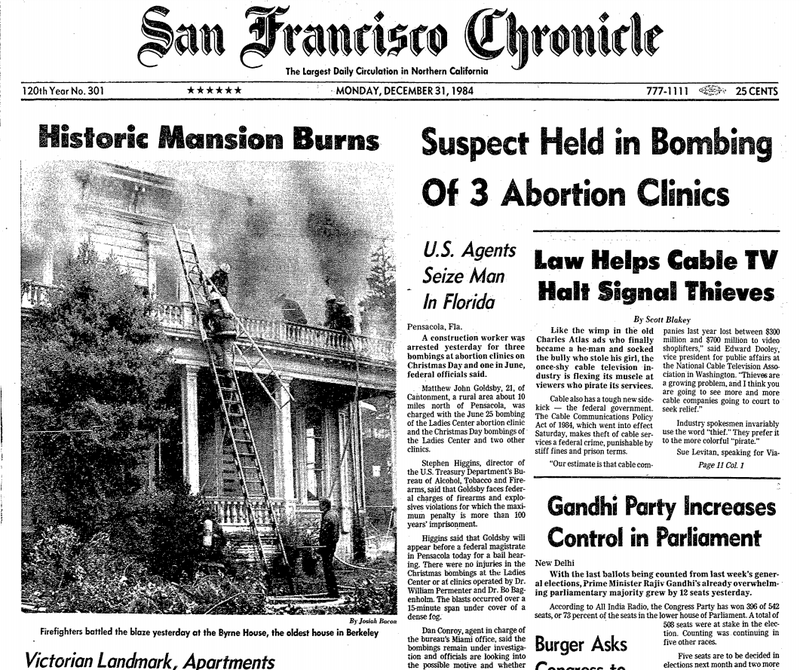 We’re delighted to announce that Oxford users now have access to the digitised archive of the San Francisco Chronicle from 1865-1984 via Readex’s America’s Historical Newspapers platform. Access is now available via SOLO or OxLIP+ (remote access for University members via single sign-on). By the turn of the century, the San Francisco Chronicle was so successful it was able to provide firsthand reports from the Klondike Gold Rush, sponsor free concerts in the streets and send reporters to cover sporting events as far away as Reno. 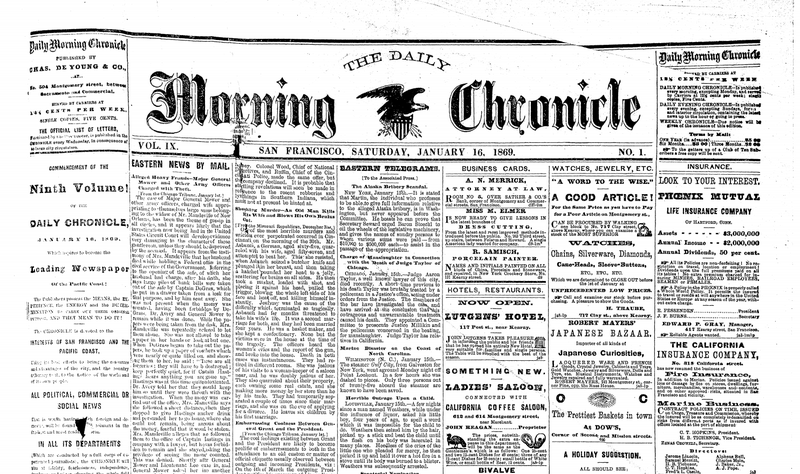 When the 1906 earthquake devastated the city, the Chronicle kept publishing. Its coverage of the stock market crash, the Great Depression and labor strikes won the paper its first Pulitzer. Later in the 20th century, the paper became known for colorful columnists like Herb Caen and the original “Dear Abby,” as well as its astute observations of the counterculture movement, gay rights and the onset of the AIDS crisis. 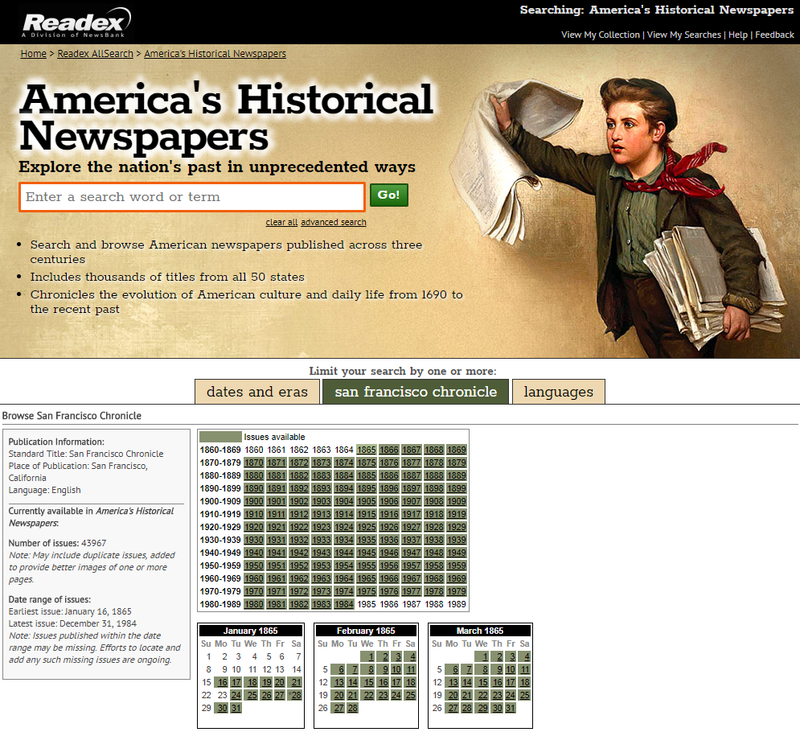 You can browse the newspaper by date, or search the full text from the initial screen. Individual issues may be read page-by-page and can also be downloaded as PDFs. Take a look at our LibGuide for information on other US newspaper archives available in Oxford and online.